The Evaluation, Research and Communication (ERC) project was a five-year initiative under the Strengthening Tenure and Resource Rights (STARR) indefinite quantity contract. Implemented from May 2013-July 2018, the goal of ERC was to create, expand and communicate evidence-based knowledge around best land tenure and property rights practices in order to enhance inter­nal USAID and external U.S. Government learning, guide program design and implementation, and make effective use of development resources to accomplish key development objectives. The project was carried out under the direction of USAID’s central land tenure unit, which underwent various restructurings throughout the life of the project and is now the Office of Land and Urban within the Bureau for Economic Growth, Education, and Environ­ment (E3/LU). It will be referred to as the Land and Urban Office throughout this report. ERC assembled and deployed a highly skilled team of evaluation specialists, communications professionals, subject matter experts in various land tenure disciplines, mapping and graphics specialists, and information technology ex­perts to achieve the project’s goals. The work performed and the results achieved are demonstrated in the graphic above and shown in detail in the main body of the report below. While the report describes the project’s many successes in detail, two broad successes bear mentioning here. First, the project’s various components, taken together, significantly advanced USAID’s position as a leader and innovator on land-tenure issues in international development. The impact evaluation studies are of a quality that is unsurpassed in the field. The USAID land tenure web site—LandLinks—is a robust platform of knowledge, data, and stories on the human dimension of land tenure that is a “go-to” place for information for development profession­als and other stakeholders. And the communications products, such as the photo library of over 6,000 high-quality images, position USAID to present its work and results effectively going forward. Second, the project transferred a large amount of knowledge and capacity to developing country stakeholders. Much of the transfer took place through the project’s direct training and information sharing activities such as the Massive Open Online Course (MOOC) and the webinars, but it also took place in the context of other activities in which training was not the central objective. Two notable examples are the training of enumerators from local data collection firms on detailed data-capture methods during the implementation of evaluations, and working with young local specialists from Burkina Faso and Tanzania while implementing the MAST pilot projects. This capacity building will contribute in ways that may not be captured in official project results, but are very real nonetheless and could have significant impacts down the road. The discussion below is organized in-line with the main project themes: evaluations and research, communica¬tions, training, and pilot projects. 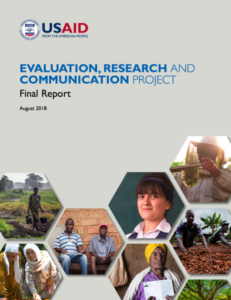 For each theme the report describes the work performed, discusses the results achieved, and offers conclusions and recommendations where appropriate.